13. Edward A. BLADES11,21,29,32,33 was born on 6 Jan 1780 in Caroline County, Maryland.34 He died on 19 May 1844 in Greene County, Missouri. He was buried in Old Reynolds Cemetery, Republic, MO. 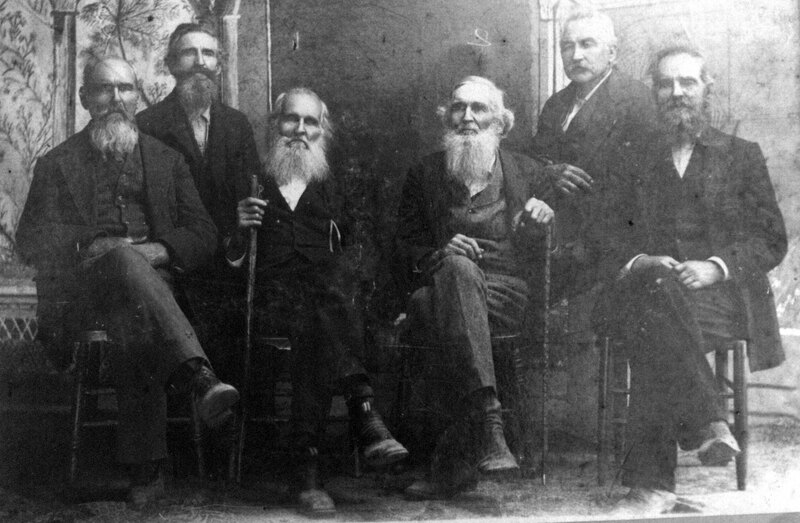 Photo: Edward and Ellen's six sons (circa 1890's). Ranson Dudley and Isaac Tillman are in the center. Family tradition says that Ellen (Penelope) was of French-Indian descent and knew no English when she first met Edward. They were said to have communicated with each other through Indian sign language. Edward and Ellen (Penelope) are buried in the Old Reynolds Cemetery just 3/4 of a mile from where they settled. The cemetery is located on land owned by Dwayne Gray (1983). ii. Sarah (Sally) Ann BLADES35 was born on 13 Jun 1819 in McMinn County, Tennesee. She died on 14 Dec 1891 in Greene County, Missouri. She was buried in Wade Chapel Cemetery, Republic, MO. iii. Ranson Dudley BLADES35 was born on 29 Jan 1821 in McMinn County, Tennesee. He died on 2 Dec 1901 in Greene County, Missouri. He was buried in Blades Cemetery, Billings, MO. iv. Nancy Ellen L. BLADES35 was born on 4 Feb 1824 in McMinn County, Tennesee. She died on 18 Mar 1887 in Greene County, Missouri. She was buried in Prospect Cemetery, Greene Co., MO. v. Cynthia C. BLADES35 was born in 1828 in Tennesee. She died on 11 Feb 1847 in Greene County, Missouri. vi. Edward A.F. BLADES35 was born on 16 Mar 1830 in Monroe County, Tennesee. He died on 4 Nov 1900 in Stone County, Missouri. He was buried in Crane Cemetery, Stone Co., MO. vii. Rebecca L. BLADES35 was born in 1833 in Tennesee. She died in 1863 in Greene County, Missouri. She was buried in Old Reynolds Cemetery, Republic, MO. viii. William Willis BLADES35 was born in 1834/35 in Tennesee. He died in Kidder, Missouri. ix. Elizabeth M. (Betsy) BLADES36 was born in 1837 in Greene County, Missouri. x. James Reynolds BLADES35 was born on 15 Nov 1839 in Greene County, Missouri. He died on 18 Nov 1907 in Greene County, Missouri. He was buried in Blades Cemetery, Billings, MO. xi. Frances Catherine (Fannie) BLADES35 was born in 1840/41 in Greene County, Missouri. She died in 1928 in Greene County, Missouri. She was buried in Wade Chapel Cemetery, Republic, MO. xii. George Washington BLADES35 was born in 1843/44 in Greene County, Missouri. He died in 1928. He was buried in Wright Cemetery, Clever, MO. Edward A. BLADES and Sally (Sarah) NICHOLS were married on 31 Jul 1815 in Rowan County, North Carolina. Edward A. BLADES and Unkown UNKNOWN were married between 1800 and 1810.